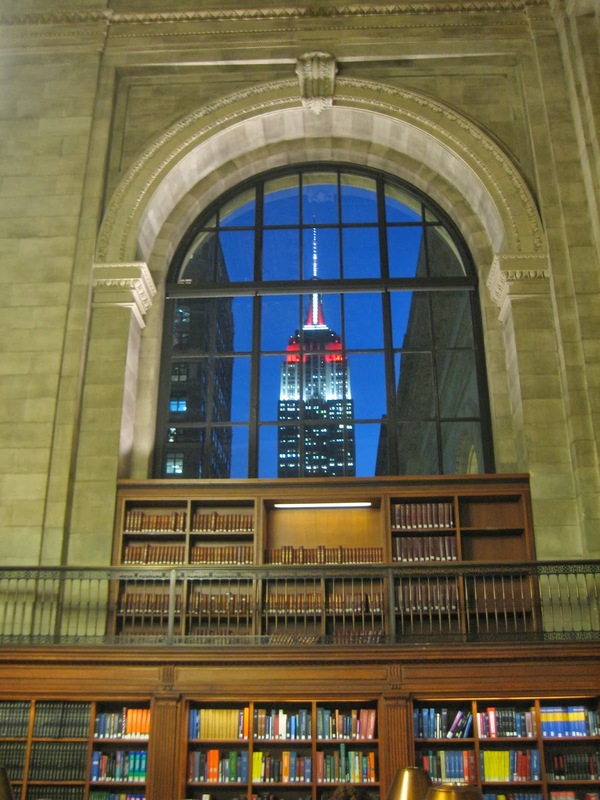 The back side of the library from Bryant Park on a summer night at dusk. 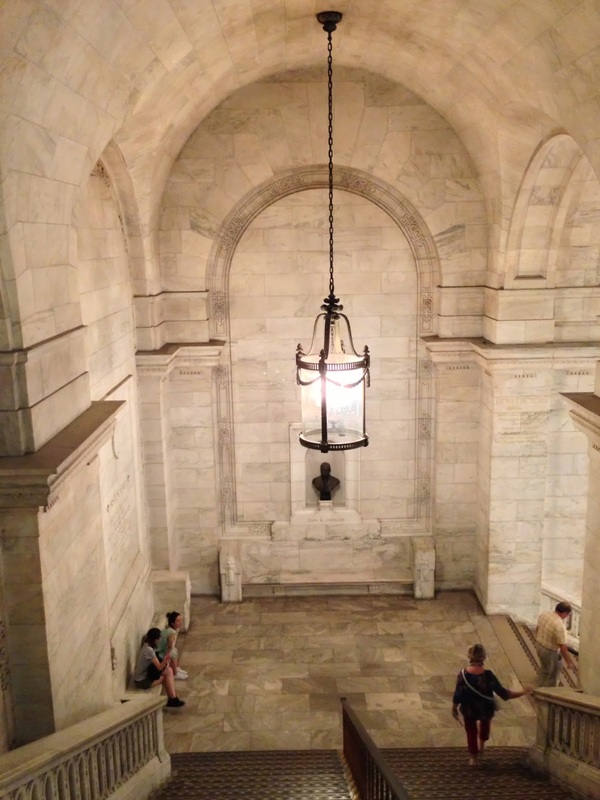 The main branch of the New York Public Library, now called the Stephen A. Schwarzman Building, at 5th Avenue and 42nd Street, is one of my favorite places in the city. I have written about it before on the blog - please go and read all about it here! I also recently attended a lecture at the library on Edith Wharton which you can read about here. where anyone can go to read or research or write. and the heavy wood tables and chairs and the elegant bronze reading lamps. and other iconic New York buildings are visible through its lofty windows. The library really is uplifting and inspirational, like a church. Across the street is the Mid-Manhattan Library which was founded in 1970 and houses the largest circulating collections of The New York Public Library. I was there recently in the building doing some research, and it is in terrible shape. Inside, it was dirty and shabby with neglect. One floor which used to be filled with shelves of books was practically empty except for tables where it seems homeless people have found a place to sit. I wasn't getting very far with my research and I asked a librarian for help, who apologized saying, "We used to have more books." I asked her about the floor vacated of shelves. She said, "The management likes a 'light and airy look.'" Huh? Less books in the library for a light and airy look? That doesn't make any sense. It's a library. Which by definition requires books. You see, there is a plan afoot. 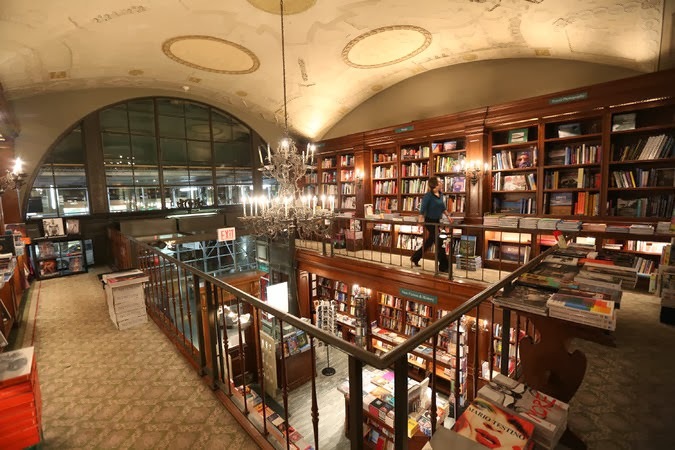 The Library has already sold off the popular Donnell Library on West 53rd Street in a controversial sale to a real estate developer. Now the Library has proposed a plan to vacate the Mid-Manhattan Library and sell the building to a real estate developer. It also wants to sell the Science, Industry and Business Library at 34th Street and Madison Avenue. 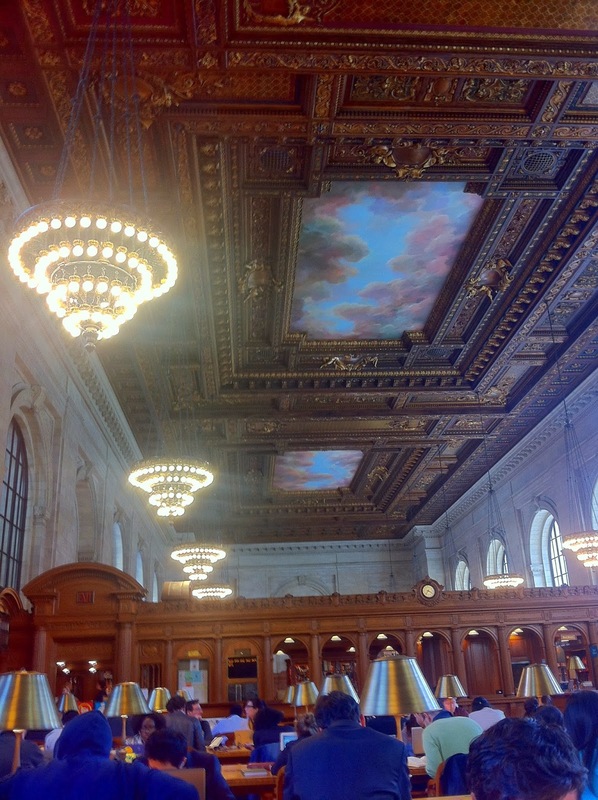 These circulating libraries would move into the main Schwarzman building which would be gutted. Its historic seven story book stacks would be demolished and 1.5 million books would be moved to a site in New Jersey. 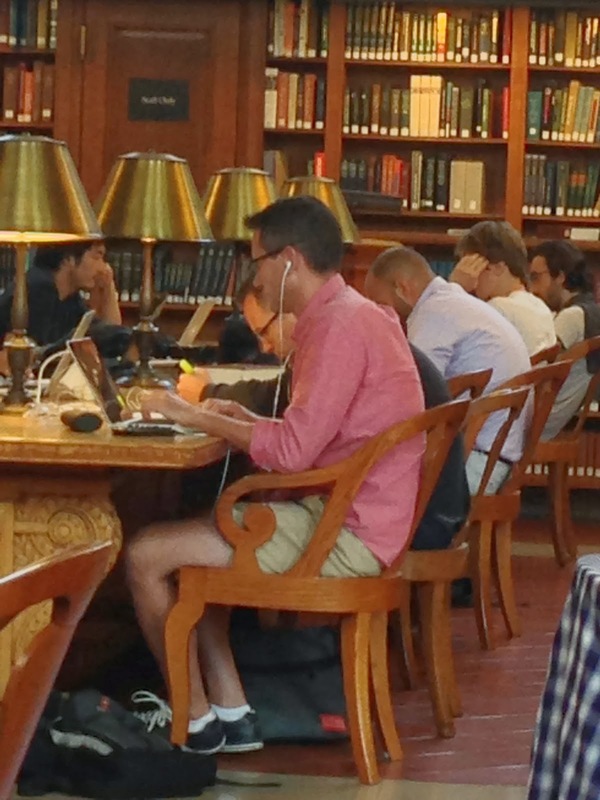 Again, there is that confounding idea of a library with less books. This plan was created through a closed door process with no public input, has been condemned by architecture critics, and will cost New York City taxpayers $150 million. During Mayor de Blasio's campaign, he promised to halt this plan, though time is now running out. You can learn more about the plan here, and write to Mayor de Blasio here to tell him to stop this plan. The limestone mansion will undoubtedly be replaced by another superluxury supertall residential building, as if New York City needs one more Bloomberg-era billionaire apartment tower stretching its long shadow over Central Park. Please go here to sign a petition to have the Rizzoli building designated a landmark which could save it from demolition. 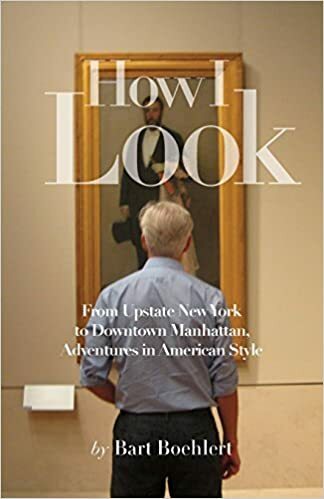 The cultural life and intellectual life of a city are just as important as real estate development but things have gotten a little out of whack here on the island of Manhattan. It's disturbing for someone who loves books and beautiful things. NOOOO this is so sad! I love the picture library right there at 40th and 5th. I will be so sad if it turns into another lame luxury building. but I do agree that it could use a little face lift. The Mid Manhattan Library.